In the previous writing we created the foundation of the importance of tire pressures. Specifically, we demonstrated a third of the vehicles on the road have an underinflated tire and further only a third of those vehicles have a warning light. We also know a 20% reduction in pressure results in substandard performance, these are the factors we are going to explore. Underinflated tires have a different profile and contact patch with the road surface. Where the tire meets the roadway is referred to as the contact patch. Maximizing the contact patch affords the driver the most performance, specifically steering and braking. What happens when we reduce the contact patch? Under inflation does just that. The contact patch is what connects the vehicle to road, when a tire is properly inflated (all other factors being ignored), the tire can give 100% of the contact patch (and the friction between the tire and the roadway) to steering, braking or a combination of both. If the pressure drops the contact patch is reduced and thus performance is also reduced - but by how much? There are varying schools of thought on this and a ton of research, for our discussion we will say underinflated tires will have a reduction in performance by 15% across all categories. But what does this really mean in the real world? Let say a vehicle traveling at 20 mph with properly inflated tires had to swerve to avoid a collision and was successful. This same vehicle with underinflated tires could successfully avoid the same collision at no more than 17 mph. Let’s increase the speeds, 55 mph properly inflated collision avoidance becomes 48 mph underinflated collision avoidance. How about braking? If a vehicle with properly inflated tires could stop in 200 feet (approximately 70 mph), the same vehicle with under inflated tires would need 230 feet. Rollovers become another related concern. 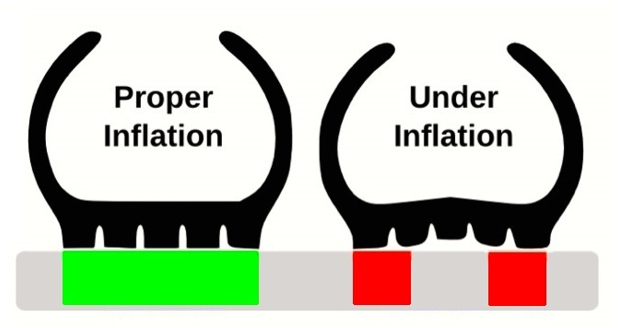 Besides the contact patch, proper inflation also affects sidewall rigidity and stability. In simple terms as a tire is asked to change direction (steer), an underinflated tire will flex enough to allow the sidewall touch the roadway surface and lift the contact patch from the roadway. In extreme cases, the tire will separate from the rim allowing the rim to dig into the roadway surface. The photo below depicts a sidewall which is experiencing this condition. The tires in this photo are still able to perform well, in part due to the very small side wall and lack of extreme under pressures. Increasing the sidewall, similar to a truck or SUV, magnifies the flex and distortion. The final point to touch on is the increase of blowouts. Underinflated tires put stress on the tire structure and increase heat inside the tire. These factors can, and do, increase the odds of a tire failure by inducing or exacerbating the layers of material within the tire to separate. Proper tire inflation is one of the single most important routine maintenance task, and ironically, one of the most ignored tasks and when considering causality, the tire pressure should be checked to help reconstruct the entire picture of the accident. Tire pressure should also be considered when determining braking distances and skid marks and is often the arbiter of the culpable party.